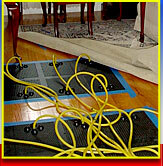 Having wet hardwood floors that have been water damaged and are cupping can be very upsetting. 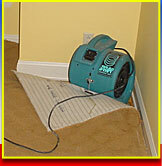 Knowing how to dry out the damp floors quickly is key to removing the moisture from underneath the wood floor. Many times the dampness and cupping can be completely dried out, saving the wood floor leaving it completely flat and dry. By using advanced methods of drying wood floors we can save the home owner and insurance company considerable demolition and repair costs. 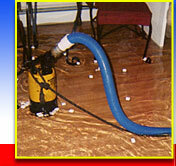 Time is of the essence in saving the wet wood floor from extensive damage. 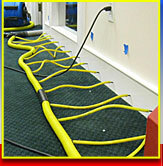 The longer you wait to start the drying restoration the greater the damage. If the dry out of the flooded floor is started within 36 hours, commonly on a standard oak floor the cupping can be flattened completely and many times the finish can be saved. Repair costs are minimized or eliminated. 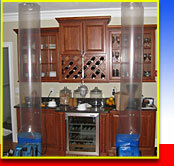 It is not uncommon that there are no other costs to fix or repair to complete the restoration. After 36 hours, drying can still be very effective, cupping can still be flattened and the finish can still be saved. But the odds of success diminish with time. 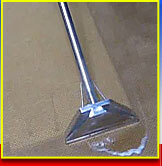 Refinishing and or removal become more probable the longer drying the wet floor is delayed. 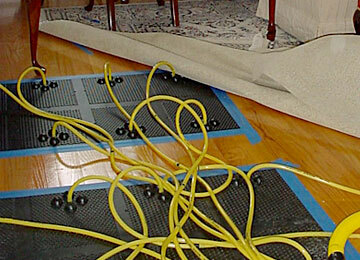 The longer the floor stays damp the less likely cupping can be removed and warping and mold damage can ruin the floor.